Each $93 box contains 36 packs. Each pack contains 10 cards. Welcome to the tropical Alola region. Start your journey with Rowlet, Litten, and Popplio, then seek out the Legendary Pokemon Solgaleo-GX and Lunala-GX to witness the awesome power of a new kind of Pokemon: each Pokemon-GX brings an attack so devastating that you can use only one of them per game! Discover dozens of never-before-seen Pokemon, Alola forms of some familiar favorites, and new ways to battle in the Pokemon TCG: Sun & Moon expansion. 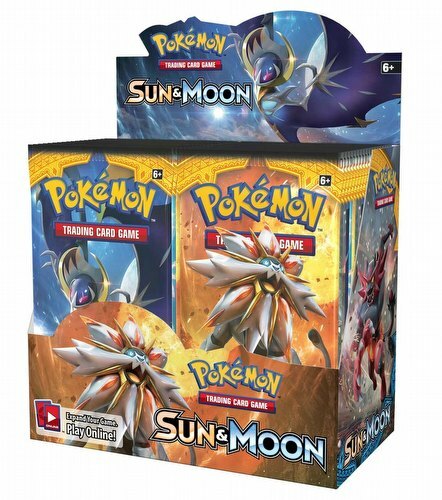 There are over 140 cards in the set, including 11 new Pokemon-GX featuring a brand-new game mechanic, and more than 40 never-before-seen Pokemon from the newly discovered Alola region.